So while I can’t profess my love for spring through song, I CAN decorate my house with beautiful flowers and vibrant spring colors. Which is exactly what I did with my spring mantel this year! 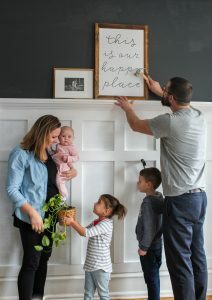 I used my favorite rustic frame in the back (originally 99 cents!) and brought one of the frames from last year’s mantel in as well. That white flower is always somewhere in my house- it was a clearance find at Michaels a few years ago. The white pitcher was from TJ Maxx. I was considering adding more to this display, but by keeping it relatively simple, you let the flowers do the talking. Which I am MORE than happy to let them do. Is it just me, or do flowers seem to *sing* on their own? 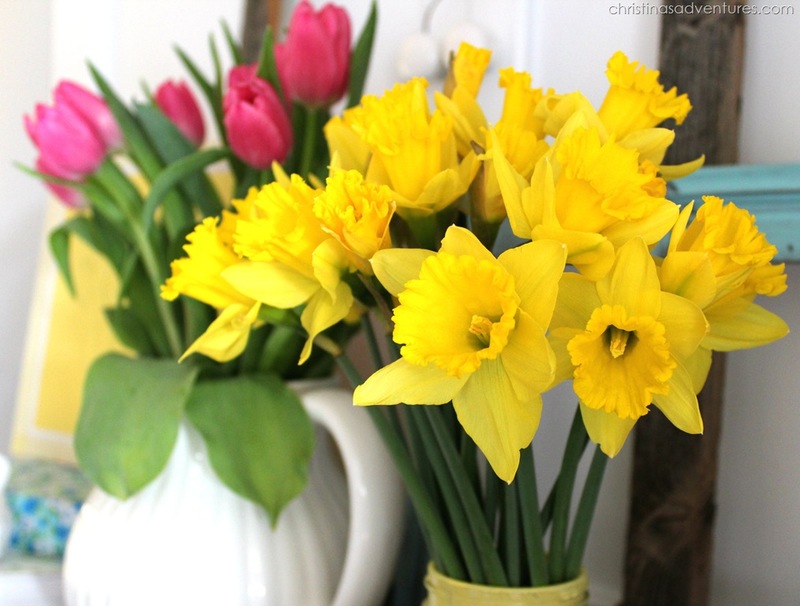 I’m in big fat LOVE with these flowers, and they brighten up any room so much! What are you waiting for? Go grab some fresh flowers and officially invite SPRING into your house! Previous Post: « 18 Weeks! The mantel looks happy and very sweet! I love your flowers!! tulips just make you happy, Id love for you to share this at our party! This is my favorite time of year too. 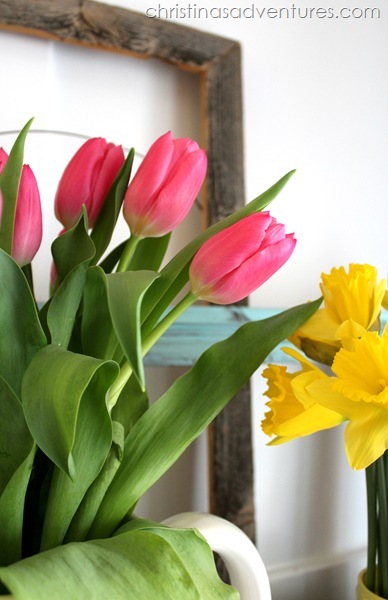 I just love tulips and your mantel is simply beautiful. 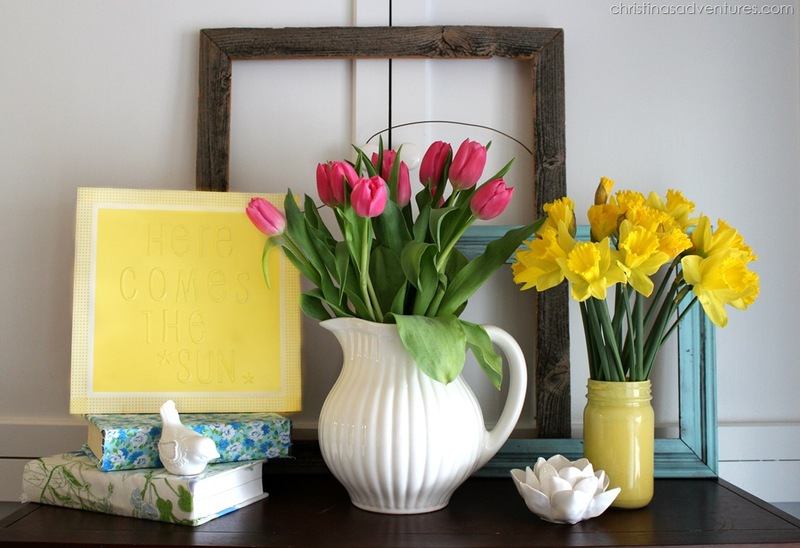 Your spring mantel is so cute! I am definitely looking forward to the sun too! I love how you balanced the coordinating colors. Here Comes the Sun! Woo Hoo!!! I love your mantel. I agree with you about fresh flowers. Everything seems so much better when you have some! Saw your post over @ Someday Crafts. This is so beautiful! I love fresh flowers in my home. I am going to share this on my blog’s FB page. The challenge this week is Spring mantels so you should come link up. The llnk up starts tonight and will go through Friday. Then, our guest judge will pick the winners. Come on over and have fun! 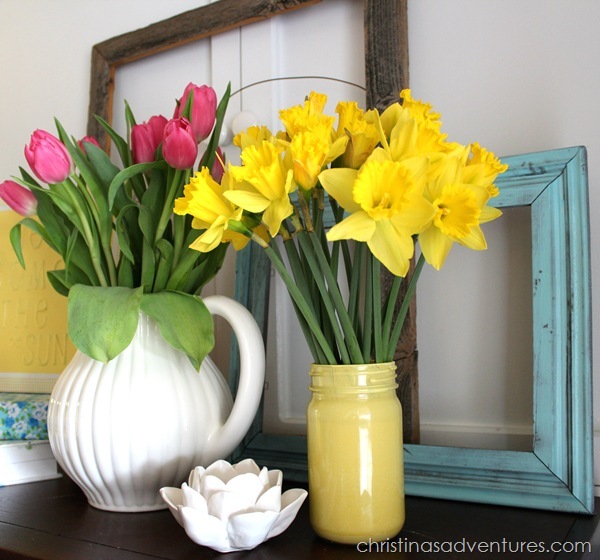 I love the simplicity of your Spring Mantel! So bright & cheerful!! Thanks so much for linking up to the “Hop To It” party! I just wanted to let you know that you are featured on my blog today! I love the little bird. So cute! 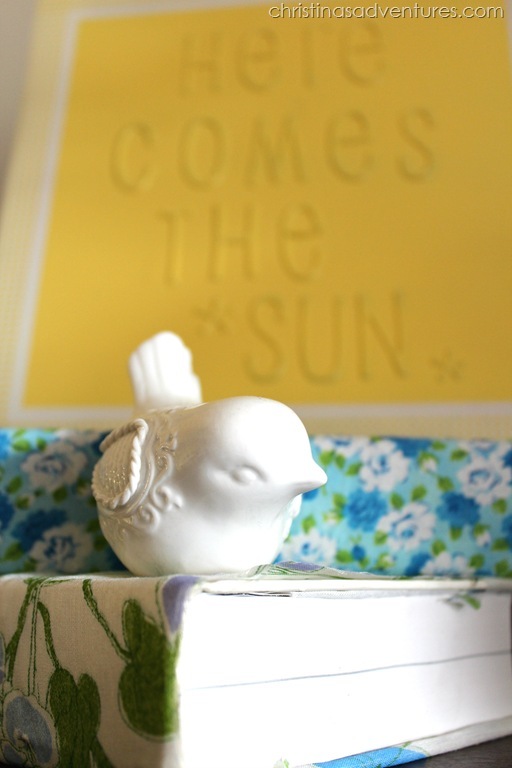 I was looking for a little bird for my Spring mantel (which I JUST finished), but I haven’t been able to find one. And yes, fresh flowers make everything just seem so happy! The flowers are such a gorgeous addition. Love it!